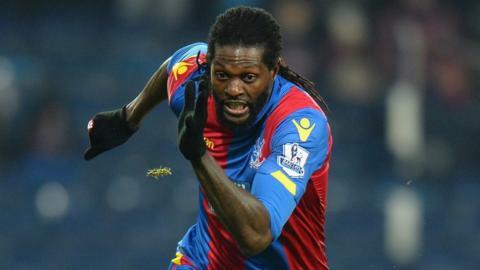 Emmanuel Adebayor ended his self-imposed international exile but failed to fire Togo past Tunisia in their 2017 Africa Cup of Nations qualifier. The Crystal Place striker had not played for his country since June and rejected a call-up for Friday's match away to Tunisia, which Togo lost 1-0. He returned for Tuesday's match in Lome but his side were held 0-0 by their Group A rivals. Tunisia and Togo have seven points but it is Liberia who lead the group. The Lone Star thrashed Djibouti 5-0 on Tuesday evening in Monrovia to go two points clear at the top of the group with two matches remaining. Only the 13 group winners are guaranteed passage to the finals in Gabon next year, with the two best runners-up joining them.